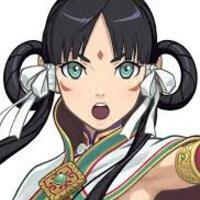 This is a continuation of a project to dub over the game; Phoenix Wright Ace attorney: Spirit of Justice. This has updated people and will add people that were left out. This series will be on Youtube and will be released in episodes. Characters will be open to audition for when needed., so if you don't see a role you want to audition for yet, just wait for the role to be open! Availability: Make sure you're able to voiced the character by the time you need to. The princess and royal priestess of Khura'in. She performs the Divination Séance, a ritual that uses a Pool of Souls to reveal what a murder victim saw and felt with the five senses before their death. Even though she hates lawyers like most of the people in Khura'in, she joins Phoenix during his investigations, making sure he doesn't do anything bad. "There is no merit to be had in indulging the ramblings born of a criminal's unclean soul." "...I-If a common boy such as he can place his trust in lawyers... it can only be because of my failure oat the Hall of Justice the other day." "You even desecrated my mother and father's teachings, you... soulless infidel!" 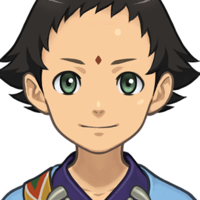 Phoenix's tour guide on his visit to Khura'in, who is also training to be a monk alongside his tour guide duties. He's a monk in training who really loves his country, and could go on and on and on about it. "That's right! Ahlbi Ur'gaid, at your service!" "Welcome to the Kingdom of Khura'in, land of spirit mediums and mystery!" "There were lots more places I wanted to show you... ...But it looks like I wont get a chance now. I'm sorry." 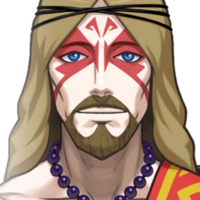 The head monk of Tehm'pul Temple, He is also a witness to Ahlbis trial, and Phoenix's first time defending in Khura'in. He plays his "One and only" Dahmalan, and keeps himself calm until Phoenix starts revealing his lies. "This blight on my soul... I'll have the child take the blame..."
"Pees'lubn Andistan'dhin's the name. I'm, like, Tehm'pul Temple's head monk." (After his first breakdown) "This is all BULL! My noggin's a rage cage and it's ready to EXPLODE, baby!" The cops and bailiffs of Kurai'in. "Ahlbi Ur'gaid, you're under arrest for treason!" "A trial isn't a tourist attraction! So clear off!" 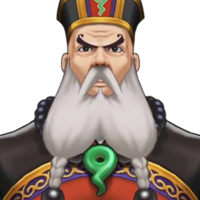 New beard edition judge of Khura'in. Ready to cut off lawyers tounges at any time. "The Divination Seance has been performed. I will now hand down my verdict against the accused." "I'll have you know, defense, that I do not allow violence in my courtroom!" Athenas little robot pal she wears around her neck. He'll usually say what Athena is thinking, which usually doesn't turn out well. He also changes colors based on how Athena feels, and helps her use her Mood Matrix while also acting like a place to look at evidence. "Stop treating me like a child!" "He's late! He's late! For a very important date!" A prosecutor who is the self-proclaimed, "rookie humiliator". He gloats about his greatness and shows his huge ego by wearing a crown, yellow suit, and sash. He has risen up the prosecutor ranks because of the fact that there are no defense attorneys. "Heh heh. Nonbelievers will only be met with suffering in the Shadow realm Twilight Realm, you know"
"Heh heh heh. Why not allow it, Your Magistry? Why not have him defend the accused?" 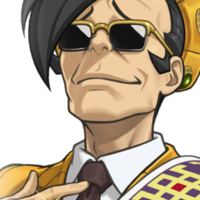 "Now then, Prosecutor Sadmadhi. 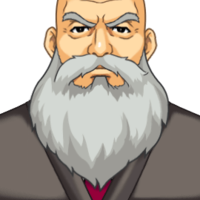 please give your opening statement"
"Court is now in session for the trial of Trucy Wright." "It looks like there are no further objections. Bailiff, please bring in the defendant."